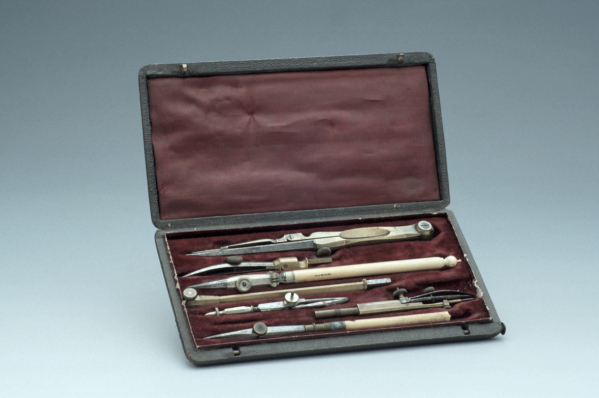 Case of drawing instruments, Late 19th Century (Inv. 46102) A particularly beautiful set of drawing instruments seen by Martin in the Museum’s collections, which is lined in red velvet and silk. Story: This is a story of unrequited love. The geometry set my parents gave to take to school was a crude steely affair in a rattly green box of tin. Boys with more affluent parents boasted pricey sets, with shiny brass compasses and dividers lying in recessed velvet beds and housed in polished wooden boxes. It was a case of visual lust. Mine worked OK, but they lacked style. Later, as a historian, I became aware that the stylishness and polish of de-luxe scientific instruments spoke less of raw functionalism and more of status. It is something of a rule that the more basic and functional an instrument was the less likely it was to survive. The ones we admire today in museums are often presentation pieces, destined to be possessed by members of the upper echelons of society. Looking at boxes of instruments in the Museum of the History of Science, shame and lust are not far away.